Secrets. We all have them. Even our characters keep secrets—sometimes from the author. 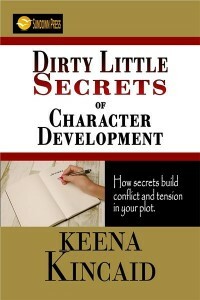 Dirty Little Secrets of Character Development workbook takes you through fun, inventive exercises to root out your characters’ hidden secrets. The lessons and exercises in the book will give you insight into how these secrets affect characters at the deepest level and give you an understanding of how these secrets to propel the plot forward in a logical, engaging manner.